Game Information. Posted by Et'Ada. This game is set in the world of The Elder Scrolls -series and based upon its rich lore and events (excluding, for the most part, Elder Scrolls Online). As such, players are expected to be at least somewhat familiar with the setting - Still, the Lore section of the Unofficial Elder Scrolls Pages and the Elder Scrolls Wiki, will likely prove handy reference guides for those with and without much experience, with TES. The Elder Scrolls: Champions is set only 50 years, after the events of TES V: Skyrim and while a relatively short time, much has changed in those years. Tamriel stands at the precipice of turmoil, with a Second Great War between the Septim Empire and the Aldmeri Dominion, looming on the horizon. You can read more about the background and setting, in the Story Information -thread. 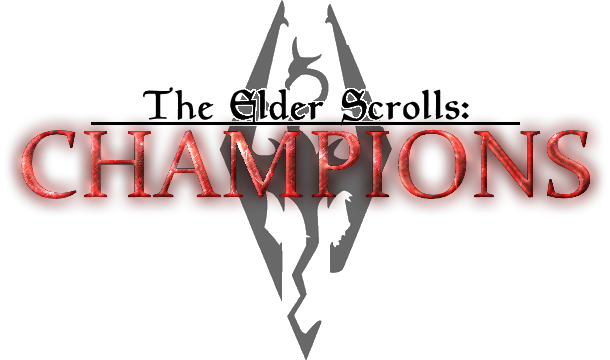 The story of Champions, will follow a small party on a divine quest to restore balance to Tamriel. In typical Elder Scrolls fashion, before embarking upon their adventure, your character spent their past few months, in a prison. As Tamriel faces chaotic times, the going has gotten rougher each year and while your character led a less-than-honorable life, they did what they did for survival. Regardless, whether they were a thief, a mercenary, a smuggler or a practitioner of forbidden arts; They were captured, tried, sentenced, imprisoned and ultimately, executed. Perhaps the town you were imprisoned in lacked the funds to maintain you, some paperwork got mixed or misplaced, or someone parted with enough gold to ensure your execution; No matter how minor or severe your crimes, you paid for them with your life. And that's where our story will begin. Now go in peace and may your fate be inscribed, within the Elder Scrolls! [23.03.2015] Updated Combat Rules to clarify the meaning of an "Action". [12.12.2015] Added health and damage -system to the Combat Rules. This message was last edited by the GM at 00:37, Sat 12 Dec 2015. • No god-modding, powerplaying or meta-gaming! Respect your peers and your GM! • I am omnipotent within the confines of MY game; My word is law, scripture and absolutely final. • HOWEVER; If I make an error, point it out in a calm and respectful fashion. I will NOT tolerate drama or drama queens. • I will NOT solve In Character conflicts in Out Of Character, UNLESS rules have been broken. • Keep Out Of Character discussion, to the OOC Thread, PMs or Private Lines. • Your characters are mortal! They CAN die, so be careful and prepare for everything! • No text-speak, emoticons or whatever. Your posts should always be in third person, past tense and most importantly in proper English. Consistently poor grammar is only tolerable if it's unintentional, such as for non-native speakers. • The above being said; Avoid editing your posts, especially during combat or other action-oriented scene, we can all read through most typos and misspellings, although it might always be a good idea to proof-read your posts, before submitting them. • Please avoid one/two/three liners in your posts, as much as possible. It's understandable that not everyone will be equally creative when it comes to posting, but you should be able to at least avoid them most of the time. • Use a color for the 'voice' of your character in your posts, whether s/he is speaking aloud or thinking to themselves. You should also always clearly differentiate speech and thought, for an example, by italicizing when your character is thinking. Once you've picked a color for your character, do NOT change it, at least without a good reason. • NEVER assume success, unless it has been confirmed by GM or the situation (even if the dice favor you!). "John knew this was their only chance and so he lifted his sword and charged into the room. John moved fast enough to kill all of the barbarians, before they could even react." "John knew this was their only chance and so he lifted his sword and charged into the room. He hoped he'd be fast enough to kill at least a few of them, before he was noticed." This game is rated M for Mature. RPol's Mature Policy. 0 = Average (Basic Education/Training), 1 = Skilled, 2 = Good, 3 = Very Good, 4 = Exceptional , 5 = Masterful. Strength = Measure of your physical prowess and brute strength. Sight = Measure of your general awareness and ability to notice/see things. Agility = Measure of your physical coordination and ability to move around. Mind = Measure of your willpower and general intelligence. Social = Measure of your charisma and ability to interact with people. You have ten (10) points to spend on your attributes. The way skills will be handled in Champions, is a little different from usual RPGs. Instead of spending X amount of points on X amount of skills, you spend your points to buy skills - Thus allowing you, the player, to decide exactly which skills your character begins with. More detailed information on magic, can be found Here. You have five (5) points to buy (or upgrade) skills with, each skill costs 1 point and starts at 0. It will be possible to advance your skills and even learn new ones. At the end of each chapter, a few skill points will be given to you, to spend on your skills. Alternatively, you can hold onto those points until the party reaches a major city or town, where learning a new skill is possible. Your character may also have one, unique 'Power'; A special ability, that can be magical or mundane in nature. For an example, a special attunement with nature, a deep knowledge of the world's history and cultures, understanding of different languages, etc. It should be something that sets your character apart, from all others, a trait. Your power should NOT be a special ability, like a spell, the ability to use thu'ums, the possession of a dragon companion or whatever. I hold full veto power over your character's Power and we'll hammer out the details, if necessary. Spells will either have to be purchased, or found in the world. When you first create a character, unlocking one of the Arcane Skills, will also grant you the most basic spell of that skill (listed below) - skills unlocked later on, will not (under normal circumstances) grant you any free spells. As there will be no magicka or other derivation of "mana points", casting spells will be restricted to a simple, 'every few turns'. In a pinch, the waiting time can be ignored, however with great penalties to spell effectiveness and to your character's exhaustion, from casting too much, too often. When combat begins, I will announce it clearly, at which point time will slow down and the story takes on a strict turn-based format, where each turn spans a few seconds of in-game time. Each character may only perform one action during their post and may post only once, during each round of turns - The order in which players post, must also adhere to the initiative sequence, determined at the start of combat. During each combat round, players post their actions after which I will make a post, containing the moves of any NPCs involved and summarizing the consequences of PC and NPC actions. This process repeats, until combat has finished. Moving over short distances (a few meters) does NOT constitute an Action, neither do other menial tasks, such as unsheathing your weapon, picking up something from the floor, drawing an arrow etc.. However attacking, accessing an inventory (chest, backpack, etc) or performing a skill-based action (casting magic, lockpicking, pickpocketing, etc) DO take up an Action, during combat play. Your character will have five (5) "health points" as a measure of their well-being. Generally these points can only be reduced from physical damage, though certain other conditions might be (or become) severe enough to deal such severe damage. Once your character loses all of their health, they die. Fear not, however, for your character's health won't be the only thing between them and the embrace of death. You will also have two other 'scores'; One, called 'Resistance' is determined by your Strength stat. The second, called 'Armor' is the bonus given by whatever armor you're wearing and most pieces of clothing will confer a (drastically) smaller boon as well. The idea is, that whenever your character is damaged, their Resistance and Armor bear the brunt (or all) of it. During combat, when your character is attacked the damage chips away at their Armor first and once that's depleted, the damage is inflicted on your Resistance. Once both of your defenses are gone, any damage dealt to your character will deplete your health and if a battle reaches that point - It may be a good idea to skedaddle. Outside of combat, if your character receives damage for whatever reason, I will use my judgement and/or dice to decide (it will depend on the particular situation) whether the damage is severe enough to penetrate your layers of defense, and if so how badly. Restoring lost health and defenses won't be quite as simple as downing a bottle of "red stuff" and hoping for the best. Damage you suffer to Armor and Resistance will be consistent and your character will retain it after battles. Also note, that if your Armor reaches zero there will be a good chance a few pieces will be completely broken and will become unusable, either for good or until repaired. A few points of Armor can be restored by taking a moment to make quick (and weak) repairs to whatever you're wearing and Resistance can be restored, by taking a moment to rest and even further by applying first aid or medicine. Resistance will be fully restored after completely removing yourself from the situation, however Armor must be repaired. Actual Health can only be recovered by really resting and taking the time to mend your character's injuries. There may also be some conditions that'll reduce your Health for good, so be careful! This message was last edited by the GM at 14:11, Sat 12 Dec 2015. Proper naming conventions and example names for each race, can be found Here. Describe briefly the appearance of your character; Height, weight, distinguishable markings, etc. Describe the history of your character, their upbringing, adolescence and ultimately, when/where were they imprisoned and what for? Write at least 300 words. This will be private. Describe your character's special power. This message was last edited by the GM at 17:21, Sun 22 Mar 2015.